Comodo Antivirus leverages multiple technologies, including Real-time/On-Access Scanning, On Demand Scanning and a fully featured Scan Scheduler to immediately start cleaning or quarantining suspicious files from your hard drives, shared disks, emails, downloads and system memory. The application also allows users to create custom scan profiles which can be re-used across all scan types and features full event logging, quarantine and file submission facilities. Comodo Antivirus detects and removes threats that are present on your machine and forms an additional layer of security on top of the threat prevention offered by the Firewall and Defense+ components. The heuristics scanning capability of the application identifies previously unknown viruses and Trojans. Real-Time/On Access scanning feature scans each and every file accessed and the system memory continuously when the computer is in use at the background. If any threat or intrusion is found, the antivirus blocks it and displays an alert immediately. The alert enables you to get the help through GeekBuddy for removing the threat or to remove it by yourself. Refer to the section The Results for more details. In order to maintain maximum security levels, Comodo advises you to run regular manual Antivirus scans in addition to the real-time scanning. On-Demand scanning is also seamlessly integrated into the Windows operating system. Users can scan specific objects ‘on the fly’ by simply right-clicking on a file, folder or drive and selecting Scan with Comodo AntiVirus’ from the context sensitive menu. 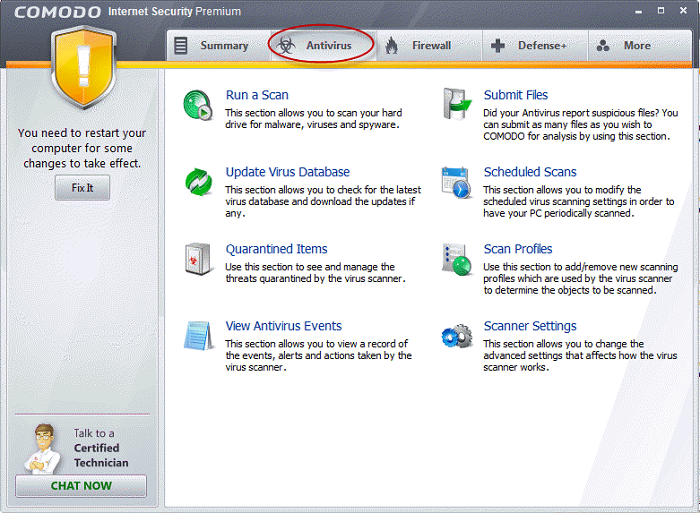 The Antivirus tasks center can be accessed at all times by clicking on the Antivirus tab from the navigation panel. The Antivirus main configuration area provides easy access to all the features. Click the links below to see detailed explanations of each area in this section.